Children at school spend so much time and hard work developing their handwriting skills, even in this age of digital communication. I used to be able to tell which of my friends had written something just by the hand it was written in, but these days? No chance. Like most people now, the vast majority of my messages and notes to other people are sent via text, online messenger and email. My husband and me occasionally leave handwritten notes for each other, and together with letters he sent in the early days of our relationship they have become treasured keepsakes. We do still send texts when we run out of milk, we’re not complete Luddites! My writing isn’t exactly beautiful, but it’s MINE. I always include a handwritten note when I send out orders, it adds a personal touch and more importantly gives me a great excuse to collect nice pens! I still use my old faithful Sheaffer fountain pen from my school days, it’s been a faithful friend for thirty years now. My favourite has to be my beloved purple Mont Blanc, an unexpected gift from a friend. With grey ink, it really is a joy to write with. The only time we see our loved ones’ writing these days is usually in a greetings card, and I have kept some cards from those I have lost, because I couldn’t bear to throw them away, a signature is such a very real mark of that person. That’s the background thinking behind this jewellery – to keep someone’s unique writing and message on something more hardwearing than a piece of paper or card. 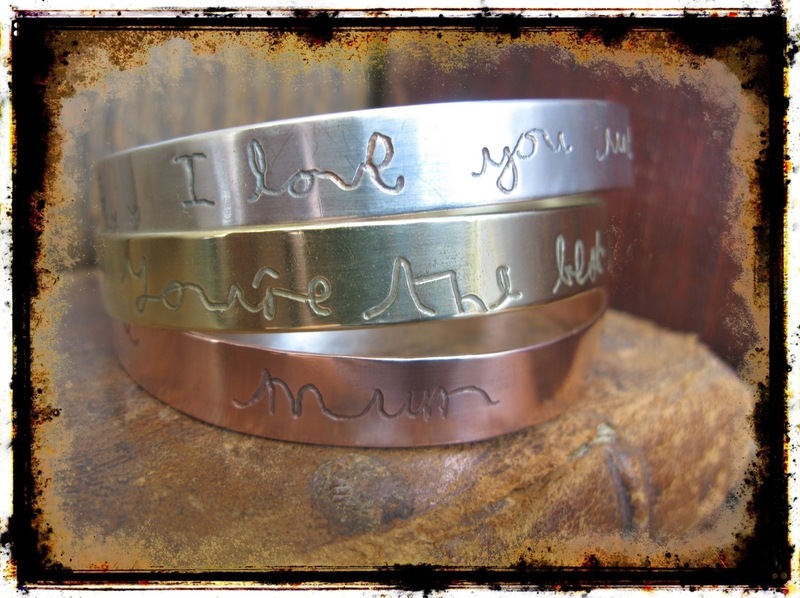 I’ll send you a strip of silver, copper or brass with a fine marker pen. You can write something meaningful to yourself on it, collect names of your children or grandchildren, get your toddler to scribble on it, or write a message to a loved one. Send it back to me, and I’ll engrave it, and turn it into a smooth, polished bangle. The silver ones go off to Goldsmiths’ Hall in London for hallmarking, and as soon as they are ready, they’ll be on their way back to you. I can also make tags, pendants and many other items with your writing as the star. You can find the bangles for sale in my eBay shop or message me in the comments section if you’d like something different. So go on, sign your name!